Mark Stevens, the handsome if rather bland leading man of Fox pictures of the 1940s, took on a tougher image in the 1950s. 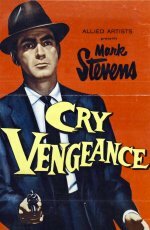 In this gripping crime drama, the first of five films he directed, Stevens plays a former detective who, after three years in prison, seeks revenge on the man he thinks framed him for a crime he didn't commit. A pulsating score and rapid editing helps give the film a lively pace, though the plot is somewhat convoluted and contrived.